No Laminitis! Conference Proceedings 2017 | ECIR Group, Inc. There is no charge for downloading these PDF files. Successful prevention or rehabilitation of laminitis takes finding the correct Diagnosis, establishing a supportive Diet—and Drugs if needed—maintaining the correct physiological Trim and, when the horse is able, an appropriate Exercise program (DDT+E). This lecture will show how a tiered-management approach maximizes the chances of success in maintaining or rehabilitating a healthy Pituitary Pars Intermedia Dysfunction (PPID) and Equine Metabolic Syndrome (EMS) equine. An extensive body of research in human and laboratory animal insulin resistance has linked obesity, inflammation, and insulin resistance. The picture in equines is less clear. We will review published findings and the implications with regard to etiology, management, and complications of Equine Metabolic Syndrome (EMS) in horses. Endocrinopathic Laminitis: How is it Different? Researchers initially assumed endocrinopathic laminitis was similar in mechanism to other models of laminitis. However, histopathological studies of tissues obtained from horses with laminitis induced via insulin infusion show a different picture. We will look at what is currently known about these differences. Because of the unique pathophysiology of endocrinopathic laminitis, usual acute care measures may be ineffective or even potentially harmful. This lecture will explore approaches to acute care that provide targeted and more effective pain control, focusing on the underlying pathology. Virtually all traditional laminitis researchers believe the hoof wall is the primary loading structure for the foot, with the laminae acting as the suspensory apparatus of the coffin bone. Our belief is that, by using the hoof wall as the loading structure, we are setting up these horses for laminitis through these husbandry practices, irrespective of the actual cause. This presentation will show, via histological observations, that by focusing on the hoof wall and this suspensory apparatus, foot tissues are potentially compromised prior to laminitis, as they are gradually adapting to this mechanism of loading and support; this sets our horses up to fail upon insult. How does Adaptation to Early Changes Impact the Hoof During Laminitis? Osteoporosis in the coffin bone is seen so often that everyone accepts it as normal. Early stage osteoporosis can be seen often, as the foot gradually loses its bone in the dorsal cortex with invasion of blood vessels and pores. We will discuss why we believe this sets the foot and coffin bone up for a catastrophic process during a bout of laminitis. Dissections of cadaver feet have shown only a limited view of equine sensory innervations of the distal limb and do not take into consideration how they affect the live animal. The horse is really interested in the sensations other than pain exclusively, to know how he can begin to be comfortable when standing. Ongoing research will be presented to show how the foot is innervated and the impact nerves have on blood flow and comfort in all gait abnormalities, especially acute and chronic laminitis, and founder. 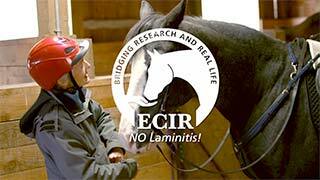 The ECIR Group has had a unique opportunity to view veterinary research and development of the recognition of PPID and IR in the Equine, along with the ability to experience first-hand how diagnosis is undertaken and how treatments succeed. This lecture will explore how that view has brought us to today. Forage is the foundation of the equine diet, yet nutrient value, common mineral deficiencies, regional differences in forages, and the factors that determine forage quality are underappreciated. Through data compiled over several years, attendees will learn the benefits of forage analysis, how to determine hay quality, the impact of quality on specific nutrients and minerals, and different approaches to mineral supplementation. Too often the trim is the last and forgotten part of rehabilitation. Learn the simple methods used to recognize common hoof capsule distortions and how to determine the corrections needed to realign the hoof capsule with the bony column. Practitioners agree that successful treatment of chronic equine foot pain requires a multimodal approach. However, there is no agreement on which modalities are the most effective, and there is limited research to guide us on the specifics. This first hour will be an introduction to the concepts and methods of chiropractic and acupuncture, two of the modalities I use most frequently when addressing chronic foot pain in horses. Attendees will gain an understanding of how the concepts and methods can be applied to other modalities that they may already be using to help horses recover from chronic foot pain. The overall health of a horse, including hooves, coat, and immune system, depends on a number of factors. Nutrition is one factor that is completely within our control and offers significant results. The most common deficiencies in pasture and hay tests are the minerals copper and zinc. It's very common for iron, and sometimes manganese, to be excessive, which can lead to a secondary deficiency in copper and zinc. The aim of this presentation is to show how dramatic an improvement can be with copper and zinc supplementation targeted to forage intake.